The first railway on the Island, the Isle of Wight Railway, was constructed between Ryde and Ventnor during 1860-1866. 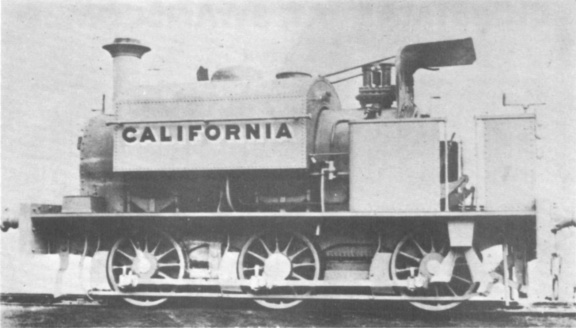 The contractor‘s name is not known, but there was at least one locomotive in use, a 12" x 18" four−coupled tank by Hawthorn‘s of Leith, named GRAFTON, which arrived on the Island in May 1862. It was advertised for sale by auction at Wroxall on 19 April 1866 but, however, was sold beforehand to Fredk. Furniss for £465, probably for use in constructing and operating the railway from Havant to Hayling Island. When with Furniss, GRAFTON was an 0−4−2 saddle tank with a ‘haycock’ firebox and a box−type saddle tank, 11" x 18" outside cylinders and 3' 6" coupled wheels. I.W. Boulton of Ashton-under-Lyne later acquired GRAFTON, renaming it BRIGHTON before resale in 1876 to Brunner, Mond’s chemical works at Northwich, Cheshire. In 1881-1882 a branch from Brading to Bembridge was built for the Brading Harbour Company by Scott & Edwards. They used an 0−6−0 saddle tank with 3' 0" wheels and 13" x 18" cylinders, Manning Wardle 517 of 1875, named STANLEY, and apparently delivered new to them for a contract at Melmerby, Yorks. On completion of the Bembridge contract, it was purchased by the Harbour Company, who named it BEMBRIDGE and hired it to the Isle of Wight Railway; the latter then used it to work the Harbour Company’s line and eventually purchased it on 2 August 1898 for £430. It was experimentally converted in August 1903 to burn oil fuel but, although showing a weekly saving of forty-five shillings, it reverted to coal burning in October 1903 as it was considered that the provision of oil storage facilities was not justified. On 3 April 1917 it was sold to the War Department for £675 and sent to Taunton; it is alleged to have gone to Iraq with the R.O.D. but there is some doubt as to whether this was so. The Freshwater, Yarmouth and Newport Railway was constructed during 1880 1888 and the contractor used an 0−6−0 side tank locomotive of main-line appearance named FRESHWATER, Robert Stephenson 2383 of 1887. The subsequent history of this engine is supposed to be that, after being untraceable for some years, it turned up as LONGDOWN on John Dickson’s contract for the Exeter Railway, opened in 1903 from that town to Christow. After a short stay on the construction of the Canada Dock in Liverpool, it went in or about 1903 to the Weston, Clevedon and Portishead Railway in Somerset, where it became 3 PORTISHEAD. They sold it to the Renishaw Iron Company in Derbyshire, where it was scrapped in 1936. In 1913 the F.Y.N.R. tired of being worked by the Isle of Wight Central Railway and acquired two locomotives of its own, one being an 0−6−0 saddle tank, Manning Wardle 1555 of 1902, new to Pauling & Co. Ltd. for their Northolt Junction-High Wycombe (G.C. & G.W. joint) contract, where it was No.56 NORTHOLT. On the F.Y.N.R. it was No.1, and survived to become S.R. W1, being scrapped in 1932. The Ryde Pier Railway in its early days between 1864 and 1884 experimented briefly with four small locomotives, but it seems clear that none of these belonged to the contractors, J. & J. Langdon. after it had been rebuilt by Kerr, Stuart & Co. Ltd. in 1895. Little seems to be known of the contractors for the constituents of the Isle of Wight Central Railway. As regards the Cowes & Newport, the first two locomotives, PIONEER and PRECURSOR, 2−2−2 well tanks by Slaughter Gruning (453 and 454 of 1861) were used on construction work but who later owned them is not entirely clear. On the line’s opening, they were in the possession of Mr H.D. Martin who worked the line under contract. At the formation of the Isle of Wight Central Railway in 1872 the new company purchased them; Martin therefore may have been the contractor. The Newport, Godshill & St. Lawrence Railway, connecting Merstone with Ventnor, was constructed between 1889 and 1900 and it appears that Westwood and Company used an old 0−6−0 saddle tank named GODSHILL with 14" x 18" cylinders, 3' 3" wheels and 11' 2½" wheelbase. It was built by the Worcester Engine Company (probably one of their first six engines in 1865-1867) and rebuilt by Kerr Stuart in 1895 with their number 81. It was later owned by J.T. Firbank and used on the G.C.R. Marylebone-St. Johns Wood contract which finished in 1900. Finally, it should be mentioned that two of the I.W.C.R. locomotives, 3 (0−4−2 saddle tank, Black Hawthorn 116 of 1870) and the engine part of railmotor No.1 (Hawthorn Leslie 2669 of 1906) were sold to Holloway Bros. in 1918 for their Middlesbrough Dock contract, the latter becoming their No.8, and believed sold later to Furness Withy, the shipbuilders nearby. I am grateful to Messrs. D.L. Bradley and R.C. Riley for permission to incorporate in the above notes information discovered by them.